The new direction in healthcare. Be there. It’s more than new health plans; it’s a whole new way of thinking. When employees understand the actual cost of their health insurance, and their health care, they are more motivated to hold those costs down. And when employers can offer low-premium plans that include ground-breaking savings accounts, innovative decision tools and access to wellness and prevention program, they can lower their own costs and make a lasting impact on the total cost of health care system wide. 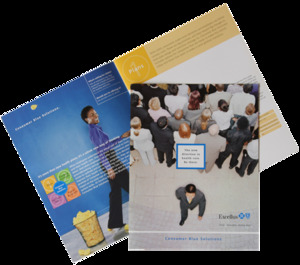 At Excellus BlueCross Blue Shield, we call all of this, Consumer Blue Solutions. 76% of employees say they would join a health plan that offered financial incentives for healthy behavior.